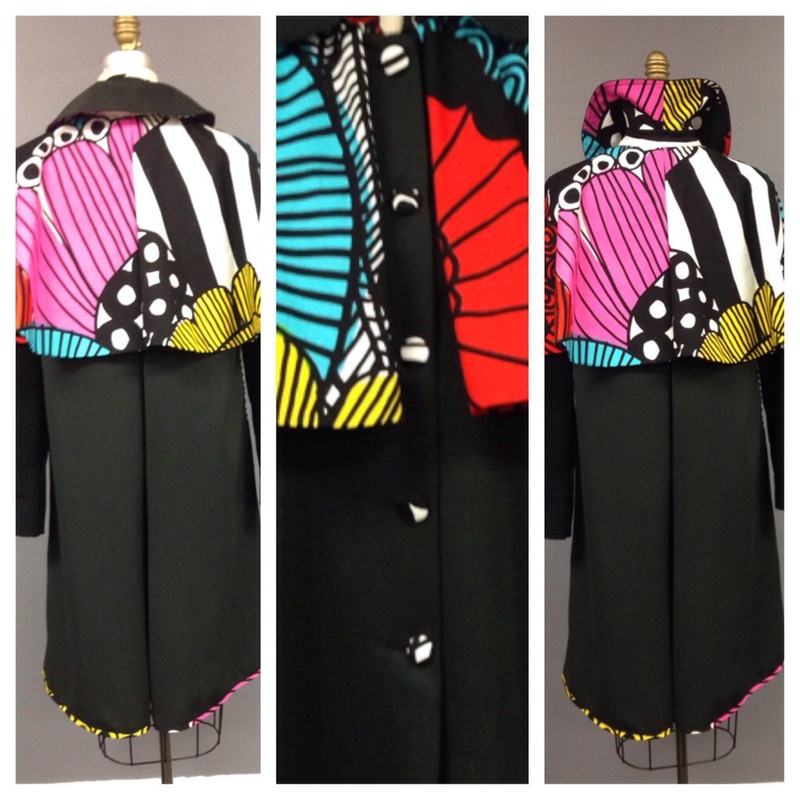 Crafted using a combination of heavy weight black cotton twill, sweater sleeves, and a multi-colored print by Finnish textile and apparel company Marimekko, I made a raincoat. I got the black twill from a local fabric store, Winmill Fabrics. The sweater sleeves were sourced from from a sweater I bought from Wet Seal. Not normally a store I shop at, I do not turn my nose up at any store where I may procure cheap materials. In this case I was able cut off the sleeves, reshaping the sleeve cap to match the existing armhole in the coat I had already constructed. The sleeve set in beautifully. 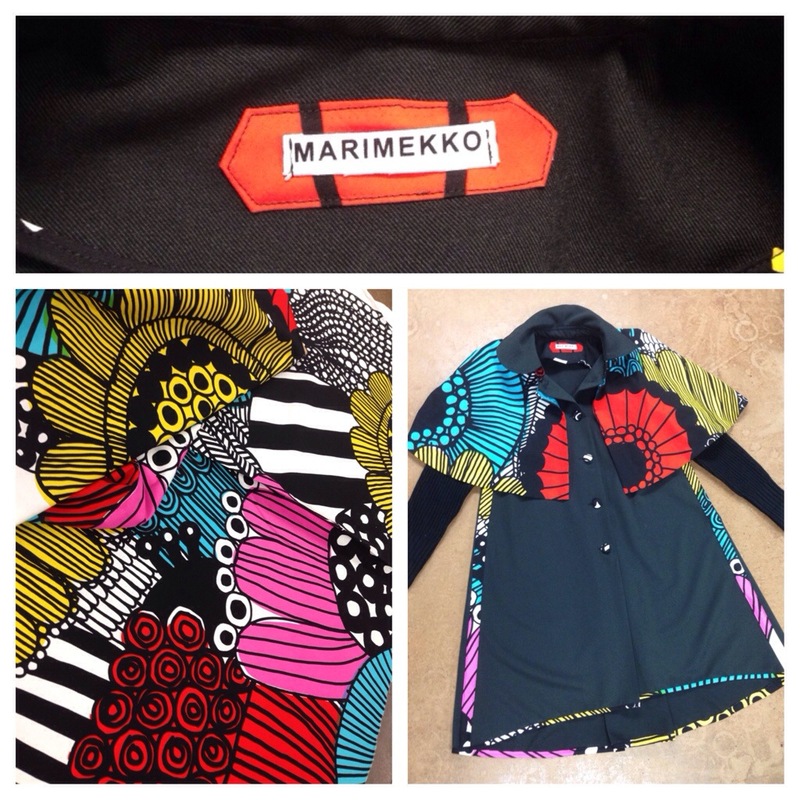 The printed fabric was generously donated by the Marimekko store on Newbury Street. With a number colorful prints and patterns to choose from at Marimekko, it was hard to choose the perfect textile for my coat. The options were a plenty, but the siirtolapuutarha print really spoke to me. “Dream- A flower blooms from the grey concrete. A morsel of nature in the urban jungle. Inspire- Strolling the streets of the city, Maija Louekari marvels at the tiny gardens tucked into the nooks of urban life. Siirtolapuutarha is Finnish for allotment, which refers to the community gardens allotted to city dwellers. 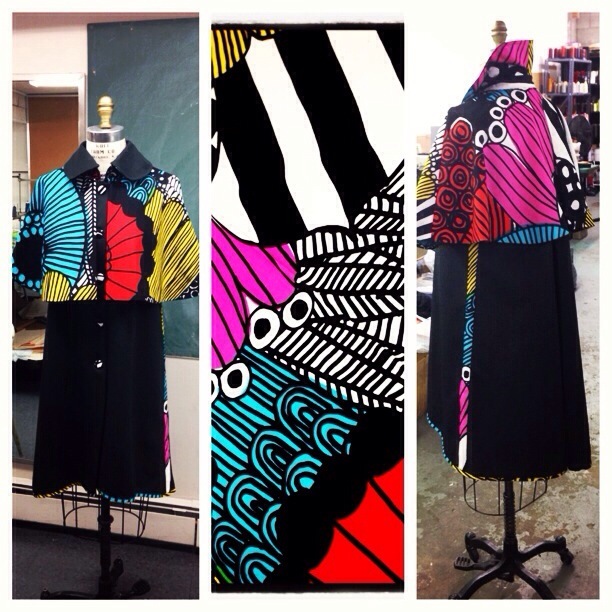 Design- Vibrant colors burst from bold, black outlines. It’s a traditional flower pattern renewed into a modern wonder. A splash of life budding into a monochrome landscape. I decided on a cape-like design for the coat. I thought the bold pattern might be too over powering if I used it for the entire thing, so I used it only for the mini caplet. 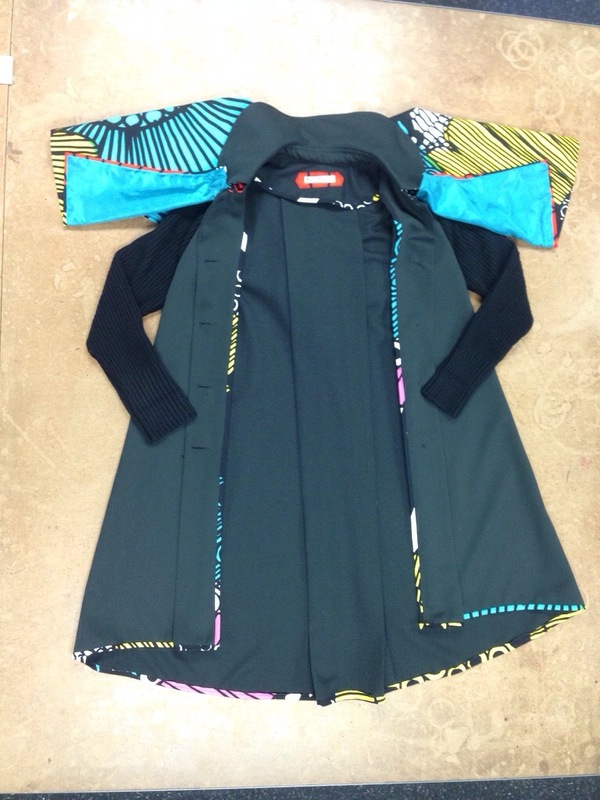 I lined the caplet using an accent color from the print: a vibrant teal. for kicks I also made a kind of make-shift label from the selvage of the fabric. creative and industrious if I do say so myself. Cute and official looking right? In an effort to keep with coat simple, I decided not to fuss with a lining. To do this I sewed the body of the jacket together with the seams to the outside, then covering the raw edges in 1″ bias strips of the Marimekko fabric, then top stitched it down for a nice finish. So I killed two birds with one stone: creating a clean finished garment without a lining and adding some coordinated design details to tie the whole look together. The inside facings are also finished in narrower bias strips in the same lively print covering all raw edges. 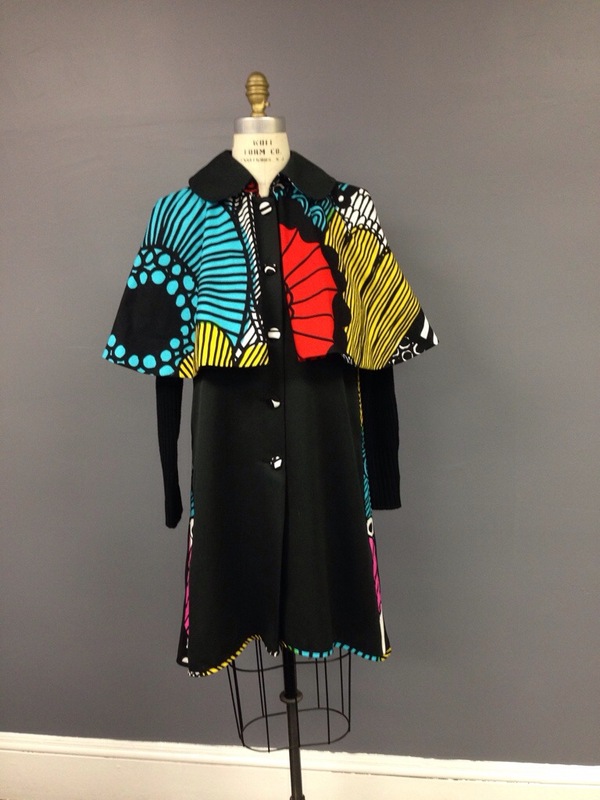 The hemline is also finished in the fun print with a bias binding. For the finishing touch, I made 5 covered buttons out of the same fabric and attached them to the jacket to pull the whole thing together! This coat was featured in Boston Magazine!